Before getting into gas prices, we'll review the Empire Fed Survey. Manufacturing sector is the weakest part of the global economy and the American economy. Biggest upcoming positive catalyst for this sector is probably the trade deal with China. That could help growth resume in the 2nd half of 2019. While manufacturing is a small part of the economy, it’s important to follow because it is more sensitive than services. Manufacturing can be thought of as a leading indicator of recessions. However, during slowdowns, if manufacturing is the only weak part of the economy it’s a false positive. The Empire Fed report is one of the first manufacturing surveys to come out, so I follow it closely even though it is noisy. To be clear, a noisy report is one that is volatile and has many swings that turn out to be meaningless. This report only measures part of the northeastern manufacturing economy and has a small sample size. You can’t expect this to be a perfect forecaster of GDP. The April Empire Fed reading is confusing because the current index increased while the 6 month expectations index crashed substantially. Personally, I follow the current index closer because you never know what firms are basing forecasts on. They might be looking at fiscal policy, trade policy, sentiment indicators, the stock market, commodities prices, or their own customers. This survey doesn’t include quotes, so we don’t know what management teams are thinking. Specifically, the general business conditions index increased from 3.7 to 10.1 which beat estimates for 6.8. However, the 6 month expectations index fell 17.2 points to 12.4. It’s great to see the general business conditions index positive, but the 6 month expectations index fell to the lowest point in over 3 years. Even though I follow the current index closer, you must give respect the larger movement in the future index. In the current index category, the new orders index rose 4.5 points to 7.5. This supports the notion that this manufacturing slowdown won’t be as bad as the one about 3 years ago. The prices paid index and the prices received indexes both fell significantly. They were down 6.8 points and 4.1 points to 27.3 and 14. 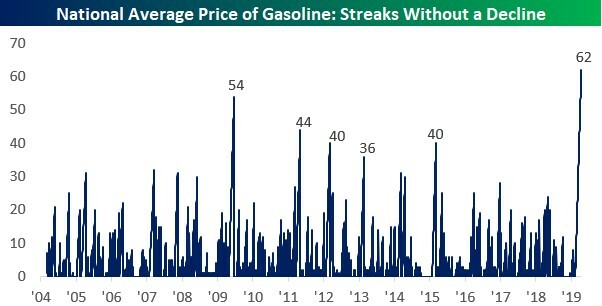 As you can see from the chart below, the national average price of gas is up 62 straight days. That’s a record long streak. While manufacturing firms aren’t at the pump with consumers, they are paying the high price of fuel. That increase must not be moving the needle for these firms. It’s certainly worth watching how rising energy prices affect margins and the consumer. Finally, the number of employees index fell 1.9 points 11.9. The manufacturing sector has been creating less jobs in the past 2 months; that trend probably continued in April. However, services can easily make up for this weakness. Future expectations are in line with the overall weakness in manufacturing. I could see manufacturing firms being bullish because of the possibility of a trade deal, but that’s not the case in the Empire index. The new orders index fell 8.5 points to 20.5. It’s pretty close to the low hit in early 2016. Similar to the current index, prices paid and priced received fell. They were down 3.5 and 7.8 points to 37.1 and 16.1. The best part of the future readings was technology spending which was flat at 20.3. However, capex fell from 31.1 to 25.2. As per usual, I will look at the Philly Fed index before I make any broad statements on where the manufacturing sector is headed. Personally, I expect it to improve in the 2nd half. The big question is how deep the slowdown gets. Right now most indexes show growth which means we aren’t near the depth of the 2015-2016 slowdown. Gas Prices - Is It A Good Time To Sell A Home? The chart below shows the survey results of Americans when they are asked if it’s a good time to sell a house. The results are broken down by income. 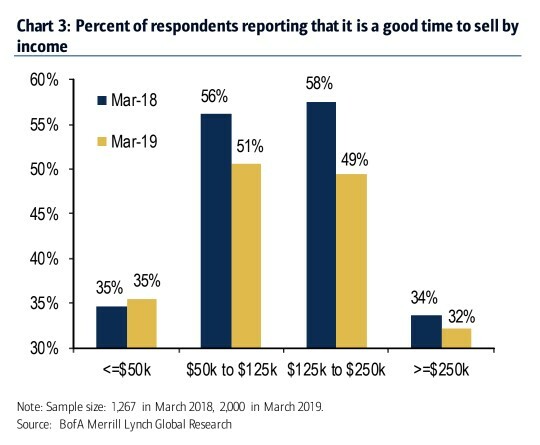 35% of those earning less than $50,000 per year stated it was a good time to sell a house in March 2019 which is almost the same as March 2018. It’s interesting to consider how many people making less than $50,000 per year are in the market to buy a house or own one that they want to sell. Their yearly change being slightly more than zero percent was the biggest increase of the groups measured. That’s probably because home builders have shifted to building lower priced houses. Those making between $50,000 per year and $250,000 per year are more emblematic of the change in the housing market from a seller’s market to a buyer’s market. Home price growth has slowed in the past few months. Another important point for those in the upper income category in states with high taxes is the SALT mortgage interest deduction has been eliminated for high earners. That’s why the decline in those making $125,000 to $250,000 is higher than the decline in those making $50,000 to $125,000. Those making above $250,000 probably don’t care about tax deductions when buying houses. They probably care more about the stock market. This week is heavy on housing data as the housing market index, the MBA applications report, and the housing starts report are all set to be released. Personally, I’m betting on the housing market improving in Q2 and driving strong GDP growth. That's even if the manufacturing sector is weak. If the general business conditions index in the Empire Fed report is accurate, we might see both areas of the economy improve in Q2. Housing starts report showed 1.162 million starts in February. In March starts are expected to increase to 1.23 million. April housing market index is expected to increase from 62 to 63. Investors are expecting both indexes to beat expectations. Also, I’m pretty confident in the housing market index improving because mortgage applications have soared. On the negative side, the average 30 year mortgage rate has increased 2 straight weeks; it is up from 4.06% to 4.12%. That’s not enough to hurt demand, but it is worth watching since I’m expecting bond yields to increase.